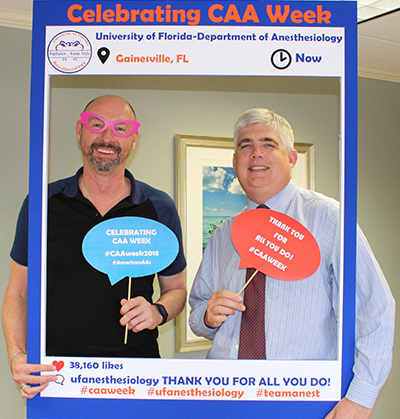 The UF Department of Anesthesiology is joining healthcare providers nationwide in recognizing the unique skills of Certified Anesthesiology Assistants (CAAs) during National CAA Week. According to the American Academy of Anesthesiology Assistants, more than 1,500+ CAAs have been providing anesthesia care to patients in the United States. As members of our anesthesia team, CAAs play a critical role in the care of patients undergoing surgical procedures. We appreciate the safe, effective care our CAAs provide to patients each and every day. On behalf of the Leadership Team and Faculty, thank you for everything you do that contributes to our outstanding patient experience and the success of UF Health. Your teamwork and support make this organization a special place to work as well as the best place to receive care!